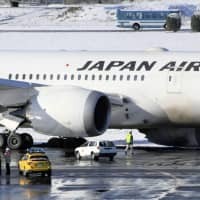 One of Narita Airport’s two runways was briefly closed Friday morning when a Japan Airlines Co. plane ran off the apparently icy runway while taxiing after landing. There were no reports of injuries among the 201 passengers and crew on board, but the closure caused disruption to other flights, according to the airline and the transport ministry. The Boeing 787 arriving from the Indian capital, New Delhi, touched down at the airport shortly before 7 a.m. 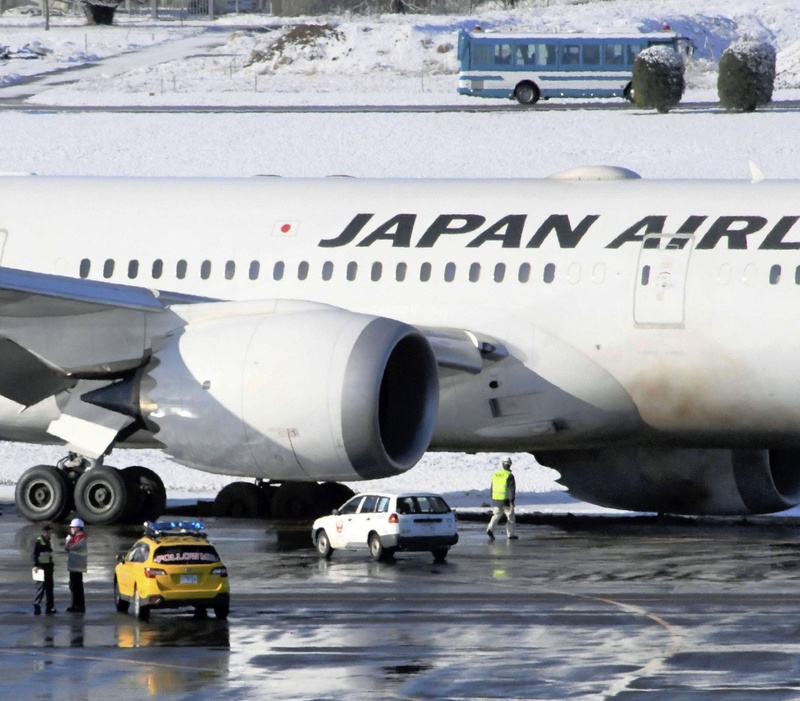 The 4,000-meter-long runway reopened around 2:50 p.m., according to Narita International Airport Co. The operator suspended its work to tow the plane from the site until late Friday night, so as not to block the runway before all of the day’s landings and take-offs were complete. The plane remains stranded, with its left main landing gear stuck in soft mud at the side of the runway. The taxiway was apparently slippery due to the cold weather and overnight snowfall, with ice on the tarmac potentially contributing to the incident. “We believe the surface of the runway was frozen. We applied brakes after (the aircraft) started skidding but we could not stop,” the captain of the plane was quoted as telling JAL. With the aid of landing steps, passengers were allowed to disembark from the aircraft from around 9 a.m. They were bussed to a terminal building. “I heard the sound of tires spinning free and saw snow fly up into the air. It felt almost like a car slipping,” said Ayumi Oshio, 58, a passenger from Hatsukaichi, Hiroshima Prefecture. New Delhi, Narita airport, runway, Japan Airline Co.